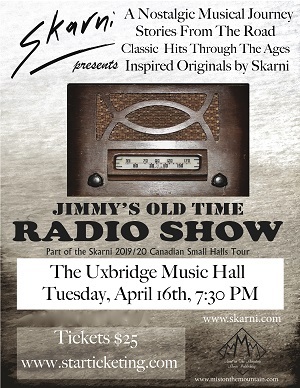 Skarni presents: 'Jimmy's Old Time Radio Show', featuring great classics, inspired originals, and stories from the road by one of Canada's busiest entertainers to the retirement circuit. A unique show! All tickets are: $25.00 and include all taxes, ticket fees and Music Hall Improvement Fund.